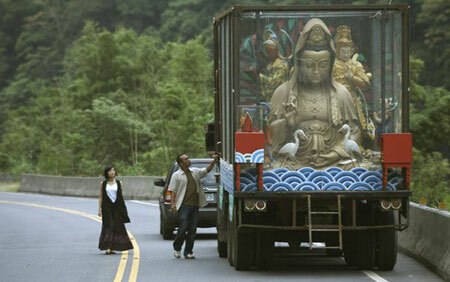 Tarcy Su (left) and Han Cheng (right) admire the traveling Buddha in God Man Dog. The Skinny: A heavy drama turns into an amusing dramedy in this accomplished ensemble film from Taiwan featuring solid performances and an award-nominated screenplay. Don't pull the plug just yet - Taiwanese director Singing Chen proves that Taiwanese cinema hasn't reduced itself to only making teen movies and Europe-friendly arthouse flicks with God Man Dog. Taking a cue from the recent spate of ensemble films, Chen explores the lives of Taiwanese people of different backgrounds who come together as the result of a car accident. Despite using a similar event and featuring similar themes, this isn't just 21 Grams in Taiwan. In fact, God Man Dog transcends the heavy drama of the Iñárritu film and become something uniquely Taiwanese, and yet with universal emotions. The film starts off with the emotionally heavy stuff quickly. First, a professional hand model Ching (Tracy Su) suffers from post-natal depression and a bit of paranoia, but her architect husband Hsuing (Han Chang, older brother of Chang Chen) has no idea how to deal with it, driving their marriage to the brink of collapse. Meanwhile, a Taiwanese Aborigine couple struggles to overcome alcoholism while also trying to repair their relationship with their daughter Savi, who was sent off to the city because of past troubles with her parents. Lastly, Yellow Bull (Jack Gao, whose performance was nominated at the Asian Film Awards) is an amputee who is saving up for a new prosthetic leg through his day job, driving a giant illuminated Buddha to various temples for religious festivals. One day, he encounters a young stowaway (Yi Yi's Jonathan Chang, all grown up) with an insatiable appetite and a talent for hiding in buses. In typical ensemble fashion, these stories will all come together, though not in a way one might expect. While a few of these plot lines do converge into a single incident, the events of God Man Dog do not surround this one incident. Chen is more interested in developing these plots as individual narratives, though the decisions some of the characters make do end up affecting one another. Surprisingly, these effects usually result in amused chuckles. While most dramas would start light and build towards an emotional climax, Chen and co-writer Yi-An Lou choose to go the other way; they weigh the film down with heavy emotions in the first half, then lighten things up in the second half with considerable humor. Chen seems to genuinely care for her characters, and she refuses to keep them emotionally tortured in favor of heightening audience emotions. This could be strange for some audiences, who may find God Man Dog to be a surprisingly light effort in the end. Amazingly enough, the transition works. God Man Dog still deals with serious themes such as alcoholism, paranoia, depression, redemption, and religion throughout - and yet it can also include a darkly funny sequence involving two underage girls pretending to be prostitutes in order to rob their customers. These extremes exist because Chen doesn't exploit the serious themes, using traumatic experiences to build her characters rather then using them to test the characters' limits. However, Chen sometimes jumps between the stories too often in the first half, moving from one tragic event to another without giving the audience a chance to get involved in the individual stories. Nevertheless, the real fun in watching such ensemble films is seeing how these characters are connected, and God Man Dog's answer to that question is satisfying enough that the stories are able to come into their own. The film's success can also be attributed to the performances. Jack Gao, known for playing mob characters, changes his image significantly for a subtle performance as the handicapped Yellow Bull. As the moral center of the film, Bull is the strongest character in the film despite being the most physically vulnerable. Gao's performance, as well as the screenplay, helps the character make a lasting impression on the audience - and this is without the benefit of any "give me an award"-style moments. On the other hand, Tarcy Su is given many of those moments as the emotionally unstable Ching. The singer/actress handles her heavy role capably, though her character is also sometimes frustrating and unlikable. Notes:  Find out more about Taiwanese Aborigines here.  (Minor spoiler) The final shot of the dogs wandering on the highway was improvised on set after seeing how the different breed of dogs were getting along, despite being of different backgrounds.